Alif Laam Raa. A book which we have revealed to you (Muhammad) so that you may lead the people from out of the darknesses into the light by their Lord's leave to the path of the All-Mighty, the Praiseworthy." 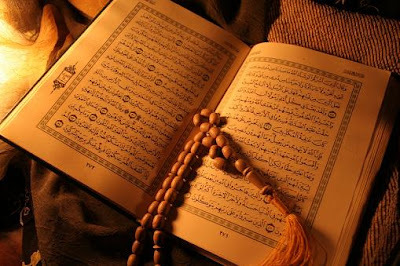 Al-Quran is a Message from Allah to humanity. It was transmitted to us in a chain starting from the Almighty Himself (swt) to the angel Gabriel to the Prophet Muhammad (pbuh). This message was given to the Prophet (pbuh) in pieces over a period spanning approximately 23 years (610 CE to 622 CE). The Prophet (pbuh) was 40 years old when the Qur'an began to be revealed to him, and he was 63 when the revelation was completed. The language of the original message was Arabic, but it has been translated into many other languages. The Quran is the eternal miracle. It is the last Book of Allah sent for the guidance of humanity through the last Prophet, Muhammad, peace be upon him (PBUH). "Iqra bismi rabbikalla dhi khalaq. Khalaqal insana min alaq. Iqra wa rabbukal akram. Alladhi 'allama bil qalam. 'Allamal insana malam ya’lam, "
The last revelation was the third verse of Surah Al-Maidah, which was sent down to the Prophet in 632 C.E.